Note: the drawings above are for the Interapid .0001" horizontal models. The parts for the .0005" indicator and the vertical models may have a slightly different appearance. Order parts for all models from the list below. Test indicators with .001" graduations such as model 312B-20 and 312B-20V will take the same parts as the .0005" indicators. Brown & Sharpe model 7025-4 is the same as Interapid 312B-1. Model 312B-15 and 312B-15V will take the same movement parts as the other .0001" models. The return lever is different and unique. Check the parts list carefully if ordering for these. 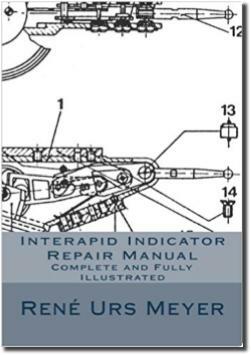 Professional repair service for the Swiss-made Interapid indicators is available from Long Island Indicator if you'd rather have us take a look. See page 30 for details. Except for contact points spare parts for the Interapid test indicators are no longer available from us. If you need other parts, please contact the manufacturer for assistance. outer dial 0-4-0 (1.5" diameter) .0001"
outer dial 0-15-0 (1" diameter) .001"
outer dial 0-15-0 (1" diameter) .0005"
outer dial 0-15-0 (1.5" diameter) .0005"
upper movement plate (top plate with jewel bearings) 0,002 mm .0001"
upper movement plate (top plate with brass bearings) 0,01 mm .0005"
Additional repair hints and instructions can be found in the Interapid Indicator Repair Manual on page 208. A selection of repair tools used by professionals for assembling the Interapid indicator are shown on page 31. Dials: Up until recently, these dials were made of metal. Nice sturdy things, cleanly printed. New models (since 2014) have replaced these with a bright white plastic dial, still nicely printed. They are a bit thinner. But be careful: cleaning solvents may affect the plastic. Naphtha does not dissolve the plastic, but it will cause the plastic to warp if you don't dry it off promptly. Better to use a water-based cleaner if you need to soak the dials. Horseshoe Clips used on the old Interapid 310 and 311 series indicators can be purchased from Mr. Wayne Root who has manufactured a supply of these. They are available on E-Bay by clicking here. Up and down pressure on the contact point should be about even. This is the function of the return lever (drawing #9) and the shape of the spring. For ideal performance, the shape of this spring should mimic that of a brand new part. Often times, this spring gets bent out of shape when it is removed during a repair attempt. Refer to our repair manual for illustrations. Crystal replacement: Interapid crystals are not user replaceable. They require a crystal press for insertion. The crystals are flat or just slightly convex, slightly over-sized and must be inserted with a crystal press. The crystal press will make them dome-shaped and this is what keeps the crystals in place. You can opt to purchase the bezel with crystal already installed (see parts list above) so that you simply remove the old bezel and screw on the new bezel with the new crystal, or you can send us the indicator with instructions to replace the crystal only. The cost is $37. Removing the bezel: The bezel is threaded and unscrews. Hold the lower bezel plate steady with a small screw driver or pin, placed in one of the two holes, while you unscrew the bezel (see details below). Stem attachment: If the mounting stem is bent or broken you can replace it with a bit of care. When you remove the old stem, don't lose the other parts. Unscrew #18, remove #19, tap out the bushing #22, save the washer#21 (which goes on the inside), then remove stem 111317. Reassemble in reverse order. Take a look at this short video to see how it's done. Be advised that we only sell the new style stem attachment. Old style stem attachments, pre-1965, are no longer available. The old style, shown in the photo to the left, had an adjusting screw built into the stem and had a 4 mm diameter chrome pin running through the sides. It did not have the components shown in the drawing above. It will not be possible to install the new style stem into the old model bodies. The bezel is screwed on, as you have probably noticed. Take a look under the rim and you will see two holes. Insert a rod, a pin, a screw driver, something small into one of the holes. This will keep the plate from rotating while you turn the bezel and now you can tighten it again, by hand. If you have the small diameter bezel, there won't be any holes but there will be two slots (you can also see this slot in the enclosed photo). The slots serve the same purpose for the small diameter indicators (but not for the large diameter).